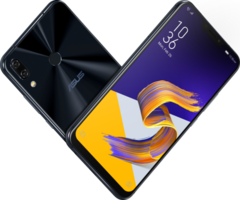 Asus and Flipkart have announced new discount offers for the ZenFone lineup to celebrate Flipkart's OMG Days sale from April 15 to April 18. 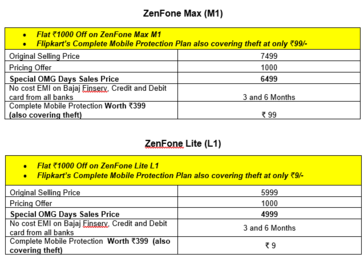 These offers include savings off the list price for all ZenFone variants except the Max Pro M2 along with easy EMI options and discounted Flipkart Complete Mobile Protection Plans that cover both damage and theft. 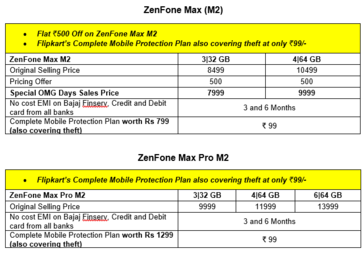 It is interesting to see that the mid-ranger Max Pro M2 has not any price cut. 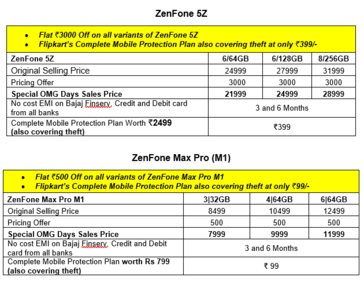 Still, at a starting price of ₹9,999, if offers good value for money and performance. Asus had offered several such discounts in collaboration with Flipkart in the past and we expect to see more of them as we near the launch of the ZenFone 6 on May 16. Do remember that the current OMG Days discount sale is valid from today till the midnight of April 18 (23:59:59) only so you might want to hurry up if you are in the market for a good smartphone deal.